There are few foods more North Indian than chole (pronounced chho-lay) or chickpea curry, and there are probably as many recipes for making chole as there are households in North India. This is the recipe my Mother has always used. In this recipe, canned chickpeas are used (who doesn't like a shortcut? ), but you can also use dried chickpeas, available from most supermarkets and specialty Indian groceries. If you do so, then factor in the time required to soak the dried chickpeas. Overnight typically works best. After a night of soaking, boil the chickpeas with a little salt, until soft and then use. 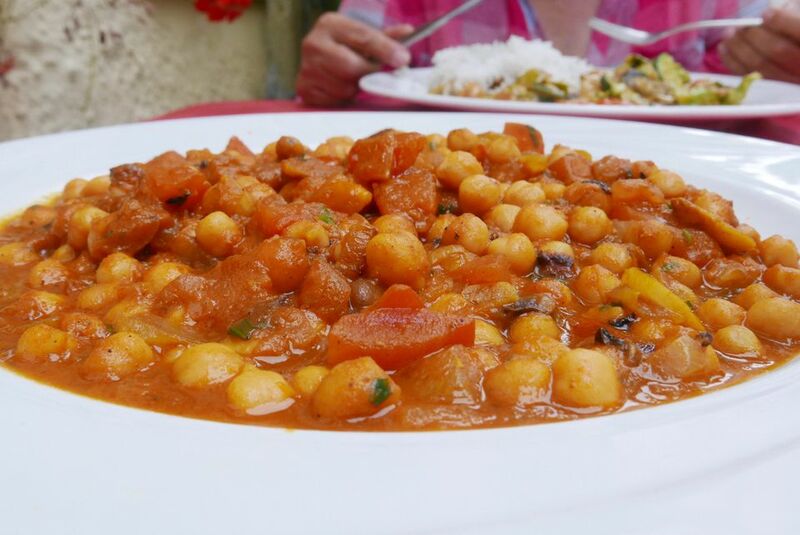 Chole doesn't freeze well, and while they taste even better the day after they have been cooked, they are best eaten the day they are prepared. Serve this crowd pleaser piping hot and accompanied by pooris or bhatooras (fried Indian bread). Grind 2 of the sliced onions, the tomatoes, and the ginger and garlic paste together into a smooth paste in a food processor. Heat the vegetable oil in a deep, thick-bottomed pan on medium heat. Add the bay leaves, cloves, cardamom, and peppercorns and sauté until slightly darker and mildly fragrant. Add the remaining sliced onion and fry until light golden in color. Add the onion-tomato paste you made earlier and fry till the oil begins to separate from the paste. Add the dry, powdered spices—cumin, coriander, red chili, turmeric, and garam masala powders. Sauté, stirring frequently, for 5 more minutes. Drain the water in the can from the chickpeas and rinse them well under running water. Now add the chickpeas to the masala you fried up earlier. Stir to mix everything well. Add salt to taste and enough hot water to make the gravy—about 1 1/2 cups. Simmer and cook covered for 10 minutes. Use a flat spoon or potato masher to mash some of the chickpeas coarsely. Stir to mix everything well. Garnish with juliennes of ginger and finely chopped fresh coriander leaves. A squeeze of lemon and a handful of very finely chopped onion tastes great as a garnish too.